Are you looking for a resume strategy that works for you? Investigate this sample resume for an entry-level clinical research technician for ideas. It's a good idea to investigate resume strategies to find one that works for you, says resume expert Kim Isaacs. 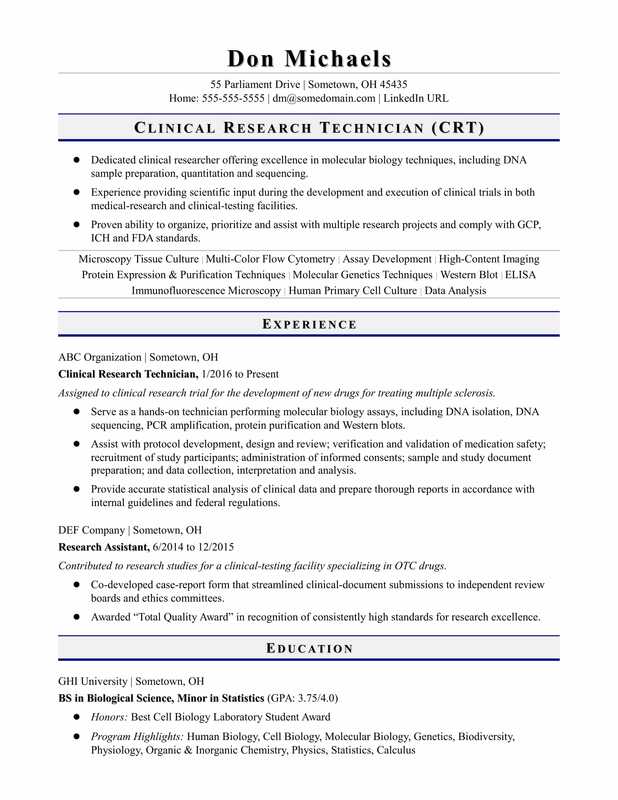 This sample resume she created below for an entry-level clinical research technician features a headline, career summary, overview of research experience and scientific credentials to express the candidate's qualifications. You can view the sample below or download the entry-level research technician resume template in Word. And if you need more help, get a free resume evaluation today from the experts at Monster's Resume Writing Service. Jobs for research technicians are projected to grow by 10% (or 84,000 jobs) from 2016 through 2026, which is faster than average, according to the Bureau of Labor Statistics (BLS). You'll find the highest level of employment for this job in the following states: California, Massachusetts, Texas, Pennsylvania, and Maryland; and in the following metropolitan areas: Boston, San Diego, Los Angeles, Denver, and Houston. As a research technician, you can expect to earn a median wage of $43,800 per year, or $21.06 per hour, according to the BLS. Additionally, you can search for research technician jobs on Monster. Dedicated clinical researcher offering excellence in molecular biology techniques, including DNA sample preparation, quantitation and sequencing. Experience providing scientific input during the development and execution of clinical trials in both medical-research and clinical-testing facilities. Proven ability to organize, prioritize and assist with multiple research projects and comply with GCP, ICH and FDA standards. Assigned to clinical research trial for the development of new drugs for treating multiple sclerosis. Serve as a hands-on technician performing molecular biology assays, including DNA isolation, DNA sequencing, PCR amplification, protein purification and Western blots. Assist with protocol development, design and review; verification and validation of medication safety; recruitment of study participants; administration of informed consents; sample and study document preparation; and data collection, interpretation and analysis. Provide accurate statistical analysis of clinical data and prepare thorough reports in accordance with internal guidelines and federal regulations. Contributed to research studies for a clinical-testing facility specializing in OTC drugs. Co-developed case-report form that streamlined clinical-document submissions to independent review boards and ethics committees. Awarded “Total Quality Award” in recognition of consistently high standards for research excellence. Learn more about science careers.